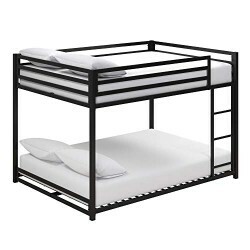 The DHP Miles Full over Full Metal Bunk Bed is an all-time favorite when it comes to a space saving sleeping solution! Crafted with strong and solid metal, the Miles bunk bed introduces forms and functions to the bedroom with its streamlined silhouette. With an industrial loft appeal, this bunk bed has a lower height than the average bunk bed, making it ideal for smaller spaces. Built with your child’s needs in mind, this bunk bed comes with a secured ladder that is integrated to the frame, lending a hand when it’s time to hop in. The Miles also includes 12.5” full-length guardrails to ensure utmost safety for the top bunk sleeper. Both top and lower bunk, include secured metal slats fully support mattress and sleeper without requiring an additional foundation; what’s more, the slats allow for better air circulation for your mattresses, making it last longer. This compact and space-friendly bunk bed is designed to be a great sleeping companion for children, teenagers and adults as it comes in various size combinations that suit every need out there. Here is to a well-made bunk bed! Space saving sleeping solution. Compact silhouette with an industrial design. Made with a sturdy metal construction. Includes secured metal slats, 12.5-inch full-length guardrails and a ladder integrated to the frame. Accommodates two standard full size mattresses (sold separately). Maximum mattress height for top bunk is 6 inches. Available in multiple colors. Full-Full bed dimensions: 74.5″L x 56″W x 54″H. Lower bunk weight limit: 300 lb. Upper bunk weight limit: 450 lb. Ships in one easy to handle box and it is simple to assemble. Shipping dimensions: 79″L x 19″W x 6″H. Product weight: 97 lb. Shipping weight: 110 lb.